Wing is an Associate Professor in the Department of Information Engineering and the Director of the Mobile Technologies Center at the Chinese University of Hong Kong (CUHK). Before joining CUHK, he spent 10 years in the US with Bell Labs, Holmdel and Qualcomm, San Diego. 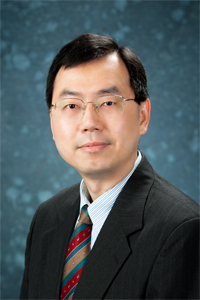 Wing received his BSEE degree from the University of Hong Kong and MS and PhD degrees in Electrical and Computer Engineering from the University of Texas at Austin. His research interests include System Modeling, Networking Protocol Design and Performance Analysis, Network/Systems Security and Mobile Computing. His recent research projects include: Online Social Network Privacy and Vulnerabilities, High Capacity Authenticated 2D barcodes and their applications, Decentralized Social Networking protocols/systems, Resource allocation for Big Data Processing Clusters and RFID protocols and algorithms. He is/has been on the Technical Program Committee for various international conferences including ACM MobiHoc, Sigmetrics, IEEE Infocom, SECON, ICC, Globecom, WCNC, VTC, and ITC. He also served as the Guest Editor for the Special Issue on High-Speed Network Security of the IEEE Journal of Selected Areas in Communications (JSAC). Wing holds 18 US patents with a few more pending. His research findings have been published in more than 100 scientific papers in major international journals and conferences. Wing is a Senior Member of IEEE and a member of ACM and Tau Beta Pi. Ronghai Yang*, Wing Cheong Lau, Jiongyi Chen*, Kehuan Zhang, "Vetting Single-Sign-On SDK Implementations via Symbolic Reasoning," in the 27th USENIX Security Symposium, Aug 2018. This work received the 2018 Internet Defense Prize (2nd Runner-up) from USENIX and Facebook. Zhibo Yang*, Huanle Xu*, Jianyuan Deng, Chen Change Loy, Wing Cheong Lau, "Robust and Fast Decoding of High-Capacity Color QR Codes for Mobile Applications," IEEE Transactions on Image Processing, accepted for publication, June, 2018. Jiongyi Chen*, Wenrui Diao, Qingchuan Zhao, Chaoshun Zuo, Zhiqiang Lin, XiaoFeng Wang, Wing Cheong Lau, Menghan Sun, Ronghai Yang* and Kehuan Zhang, "IoTFuzzer: Discovering Memory Corruptions in IoT through App-based Fuzzing," in the Network and Distributed System Security Symposium (NDSS), Feb 2018. Ronghai Yang*, Wing Cheong Lau, Shangcheng Shi*, "Breaking and Fixing Mobile App Authentication with OAuth2.0-based Protocols," 15th International Conference on Applied Cryptography and Network Security (ACNS), Kanazawa, Japan, July 2017. Ronghai Yang*, Wing Cheong Lau, Tianyu Liu*, "Signing into One Billion Mobile App Accounts Effortlessly with OAuth2.0," Black Hat Europe Briefings, London, Nov, 2016. Ronghai Yang*, Guanchen Lee*, Wing Cheong Lau, Kehuan Zhang, Pili Hu*, "Model-based Security Testing: an Empirical Study on OAuth 2.0 Implementations," ACM AsiaCCS, Xian, June, 2016. Pili Hu*, Ronghai Yang*, Yue Li* and Wing Cheong Lau, "Application Impersonation: Problems of OAuth and API Design in Online Social Networks," ACM Conference on Online Social Networks (COSN), Dublin, Oct. 2014. Pili Hu*, Wing Cheong Lau, "How to Leak a 100-million-node Social Graph in just one week ? - A Reflection on OAuth and API Design in Online Social Networks," Black Hat USA Briefings, Las Vegas, Aug. 2014. Chak Man Li*, Pili Hu*, Wing Cheong Lau, "Demo: AuthPaper - Protecting Paper-based Documents/ Credentials using Authenticated 2D Barcodes," in the Procs. of ACM MobiSys, June 2014. This work also won the Grand Prize (Research &Development Category) in the 13th Asia Pacific ICT Alliance (APICTA) Award. Huanle Xu*, Gustavo de Veciana, Wing Cheong Lau, Kunxiao Zhou, "Online Job Scheduling with Redundancy and Opportunistic Checkpointing: A Speedup-Function-Based Analysis," accepted by IEEE Transactions on Parallel and Distributed Systems, Sept 2018. Huanle Xu*, Wing Cheong Lau, Zhibo Yang*, Gustavo de Veciana, Hanxu Hou, "Mitigating Service Variability in MapReduce Clusters via Task Cloning: A Competitive Analysis," in IEEE Transactions on Parallel and Distributed Systems, Vol.28, Issue 10, Oct 2017. Huanle Xu*, Gustavo de Veciana, Wing Cheong Lau, "Addressing Job Processing Variability through Redundant Execution and Opportunistic Checkpointing - A Competitive Analysis," IEEE Infocom, May 2017. Huanle Xu*, Wing Cheong Lau, "Optimization for Speculative Execution in Big Data Processing Clusters," in IEEE Transactions on Parallel and Distributed Systems, Vol.28, Issue 2, Feb 2017. Huanle Xu*, Ronghai Yang*, Zhibo Yang* and Wing Cheong Lau, "Solving Graph Problems in MapReduce-like Frameworks via Optimized Parameter Configuration," The 15th International Conference on Algorithms and Architectures for Parallel Processing (ICA3PP), Zhangjiajie, China, Nov. 2015. Huanle Xu* and Wing Cheong Lau, "Task-Cloning Algorithms in a MapReduce Cluster with Competitive Performance Bounds," in IEEE ICDCS, July 2015. Huanle Xu* and Wing Cheong Lau, "Optimization for Speculative Execution in a MapReduce-like Cluster," in IEEE Infocom, Apr. 2015. Huanle Xu*, Wing Cheong Lau, "Speculative Execution for a Single Job in a MapReduce-like System," in the Procs. of IEEE Cloud (The 7th IEEE International Conference on Cloud Computing), June 2014. Behdad Heidarpouar*, Zbigniew Dziong, Wing Cheong Lau, Shahin Vakilinia, "Pricing the Volumed-based Data Services in Cellular Wireless Markets," IEEE Transactions on Network and Service Management, Feb 2018. Wai Kit Sze*, Yulin Deng*, Wing Cheong Lau, Murali Kodialam, Thyaga Nandagopal and OnChing Yue, "Channel Oblivious Counting Algorithms for Large-scale RFID Systems," IEEE Transactions on Parallel and Distributed Systems, Dec 2015. Huanle Xu*, Pili Hu*, Wing Cheong Lau, Qiming Zhang* and Yang Wu*,"DPCP: A Protocol for Optimal Pull Coordination in Decentralized Social Networks," IEEE Infocom, Apr. 2015.